This property was built in the year 1689 as a private dwelling place with stables and outbuildings. It was first owned by a Matthias Wakeham, a corn merchant of Deal who lived here between 1689 and 1702. Upon his death in 1702 his son Isaac inherited it. In 1721 Isaac sold it to a Henry Mowle, a corn and flour dealer. In 1746 it then passed to Henry’s son Jacob who was a baker by trade. Jacob probably installed ovens as the property then became a bakery. In 1763 Jacob Mowle sold it to another baker, a John Nash of Water Street, Deal. In 1781 it was sold to Richard White, also a baker and dealer in corn and flour. By this time the property had taken on the appearance of a shop and was renowned for its trade. Richard White died in 1804. He bequeathed the house, all its contents, implements of trade and £15 in lawful money to his son James. James lived in the house and carried on with his late father’s business until the year 1808. In March of that year he obtained a licence to sell ale from the premises. Thus, for the first time James White opened its doors as an ale house. He was still baking bread as well as serving ale. By 1818 it was known as The Magnet ale house, Upper Deal. James White died in 1832.His widow Eliza inherited it and continued to run it solely as an ale house until her death in 1837. It then passed to her daughter Mercy, a milliner of Lower Street (now the High street), Deal. Mercy ran The Magnet until 1840 when she sold it to Edward Iggulden, a brewer of Lower Street. He installed a William Pittock Verrier into the house as a tenant. In 1848 a wine and spirit licence was granted. It then became a registered public house. In that same year (1848), The Magnet, along with other licensed premises was purchased by Hills & Sons, brewers of Lower Street. During the time that W.P. Verrier kept The Magnet, his brother Richard, who had once kept the nearby ‘ Bowling Green’ tavern, kept another inn called the Five Bells. This has since been demolished. Verrier kept The Magnet until his death in 1871 when his son George Albert Verrier took over. In 1874 The Magnet, along with several other licensed premises was purchased by Cobb & Co., brewers of King Street Margate. G.A. Verrier continued as tenant until 1889 when he was succeeded by John Samuel Bushell. He was a saddler and harness maker of 11 Lower Street. He also operated a successful saddlery and harness repair shop from a converted outbuilding. In 1898 Bushell was succeeded by Walter Partridge, a victualler of Canterbury. In 1904 he handed the business to Richard Currie, another victualler. R. Currie, in 1906 handed it to Alfred Bear, an earthenware dealer of Walmer. 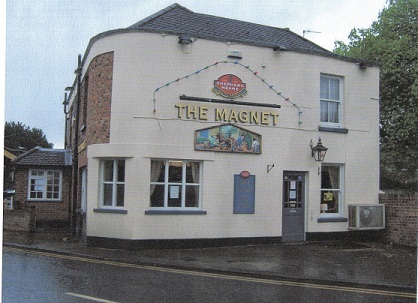 He served The Magnet until 1911 when it was succeeded by John Mockett who came from a prominent family of victuallers. Mockett kept The Magnet until 1920 when he handed it over to Liza Mary Verrier, a niece of George Albert Verrier. She left in 1929 and was succeeded by Arthur G. Powell, who was then succeeded in 1933 by Robert Reid and he in turn by George Neeve in 1936. The Cobb brewery sold out to the Whitbread brewery in 1968. Shepherd Neame became the owners in 1989.